A spur-of-the-moment decision. I boil water for tea, wrap up cheese and sausage, cut an apple into wedges, grab the dark chocolate and put my hiking boots by the door. 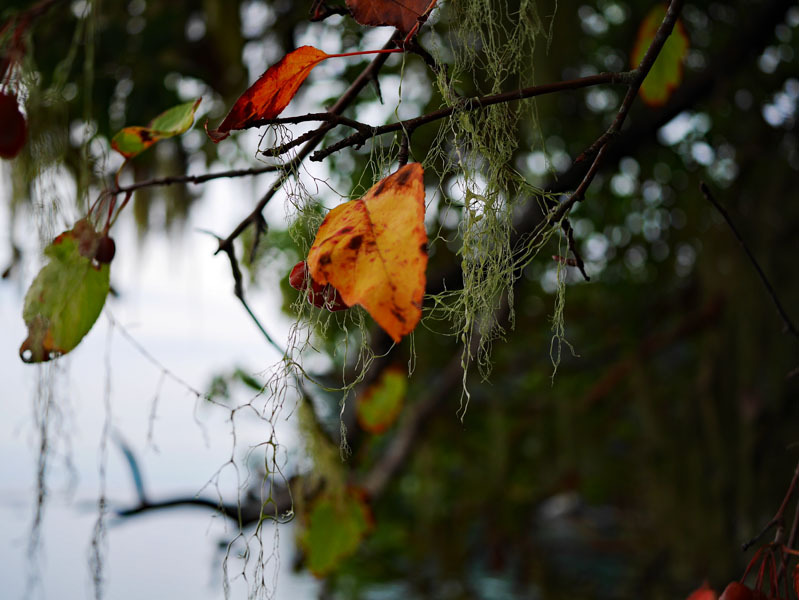 And we're off to East Sooke Park, the best place for hiking, in our opinion. Water, forest, sky, mountains. 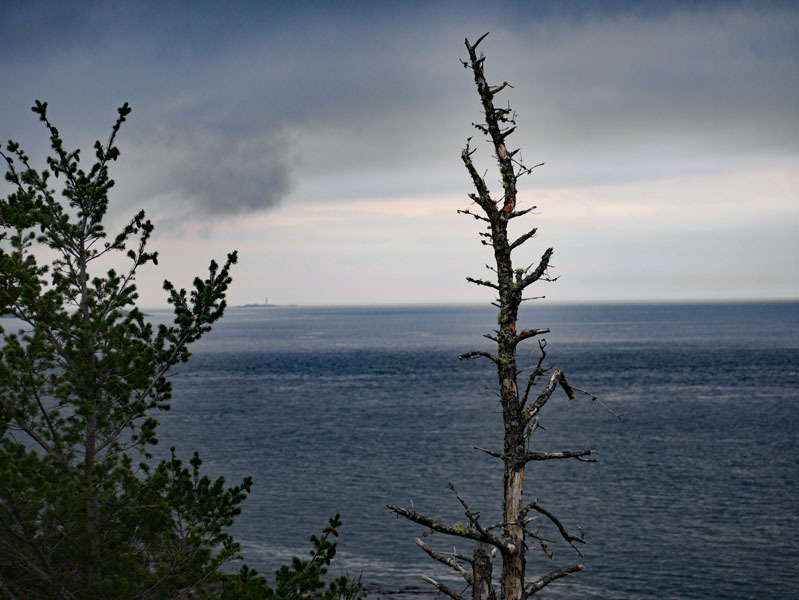 As we begin, skies look dark and ominous, but Tim's pack contains rain gear and hot tea. We usually take the coast trail to Beechy Head, and then a shorter inland trail back to the parking lot. This time, we do it in reverse. What a difference! It hardly looks like the same trail. Do you ever do things the opposite way and find a fresh perspective? 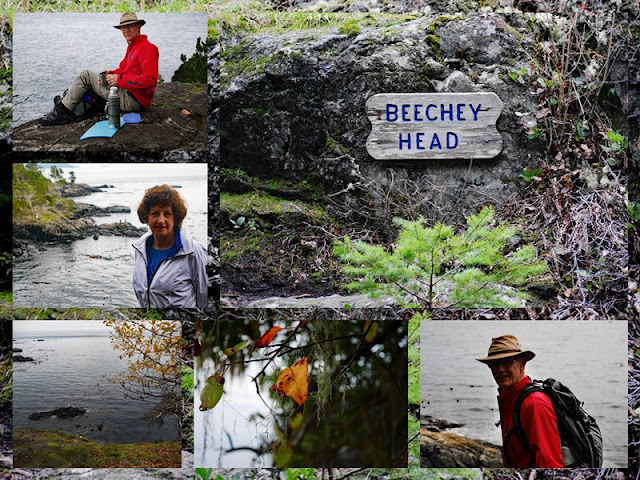 Beechy Head is one of the points from where the boundary of between the USA and Canada is marked. We perch on a rock ledge high above the water, hoping the rain will hold off. It does. A bit of sunshine peeks through and the wind dies down as we drink our tea. 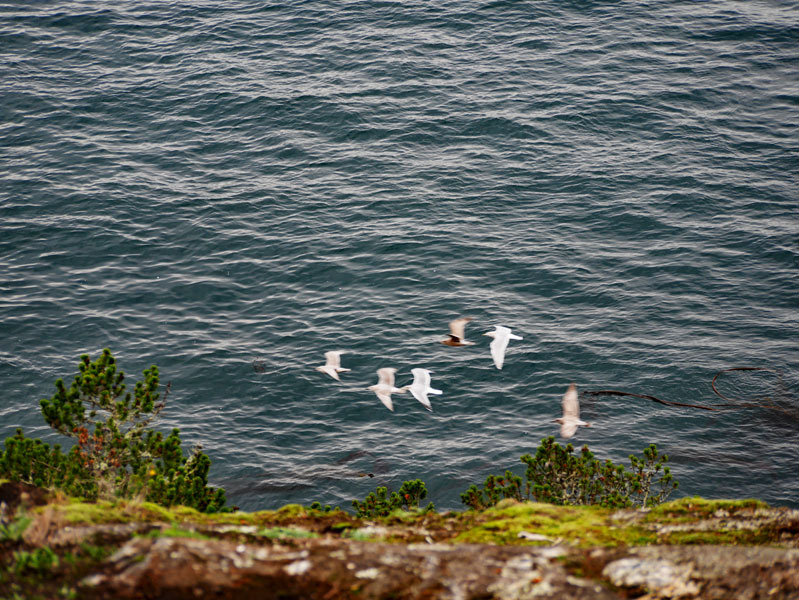 Below us, nearer the water, gulls sail by; singles, doubles and groups. Where are they going? 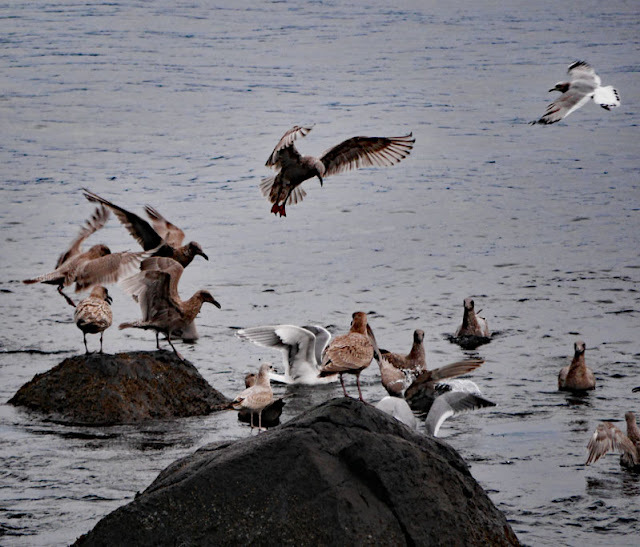 Is there a gull party somewhere? We were not invited. In the distance, monotones prevail, a hundred shades of blue and grey. 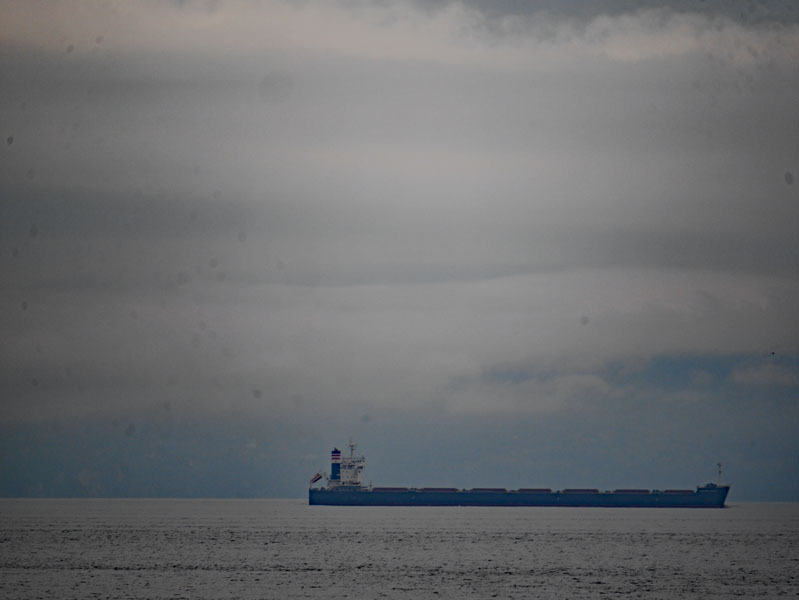 A mostly empty container ship glides down the strait, a thin, crisply delineated shape in the blurred landscape. The softened focus of the larger views sharpens as I zero in on what's nearby. Puffs of the lichen cladonia ciliata (I think) resemble soft, pale green sheep fleece. We follow the trail along the coast. Up and down we clamber, stopping frequently to admire the view. 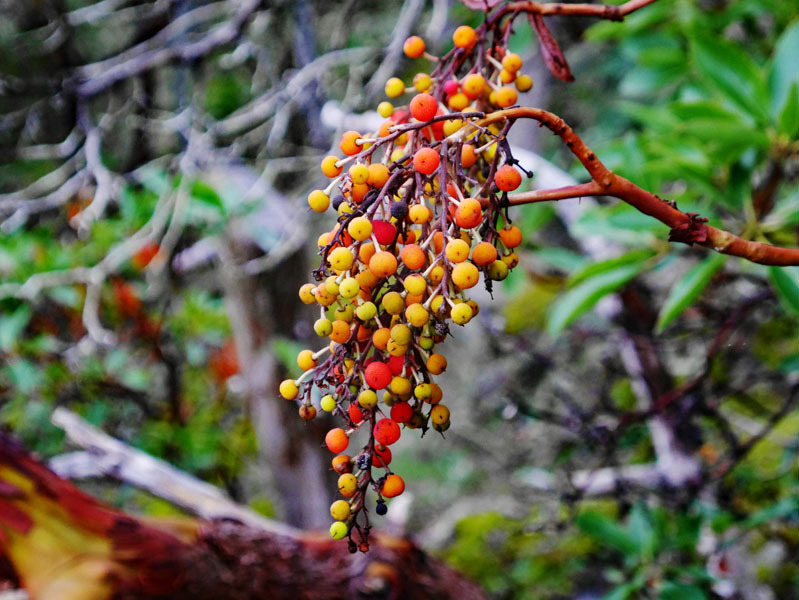 Arbutus berries, yellow, red, and gold, dangle from a spindly branch. Flocks of squawking gulls cluster around a bed of sea kelp as we near the end of our 3-hour hike. We drive home, tired but restored in body and mind. Here, in unspoiled creation, I sense God's presence. Beauty soothes and inspires. Lovely to see pictures of your hike, beautiful scenery. I especially like your photo of arbutus berries, I've never seen them before. I always thought familiar things look different when approached from another direction too, thank you for reminding me of that feeling. Visiting from Mosaic Monday. Good morning, Lorrie, what a beautiful place you've taken us to today. 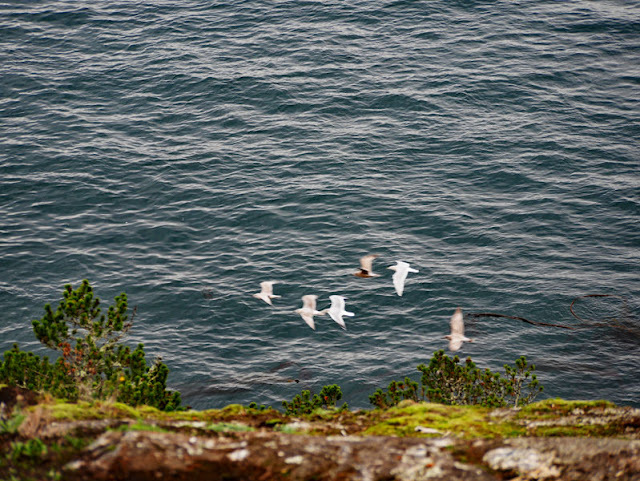 The scenery, the water, the birds flying by, at first glance I thought the white lichen was snow! A wonderful way to start the week. What a wonderful hike! 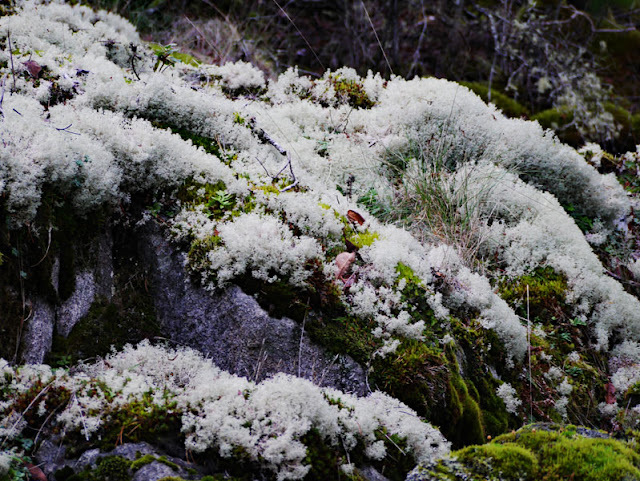 Such beautiful scenes and flora and fauna--the fluffy white lichen is beautiful. I read that the border between Canada and the USA is the longest undefended border in the world. Glad no one feels compelled to build a wall there...lol. IIt is always fun to hike in different directions. We di that too for change of pace. I too took a quick glance and thought you had found a snowy patch. What unusual lichen that is. We have Beachy Head in England but it's not exactly a border, though pretty near the 'edge' of the country. What a gorgeous walk. Spur of the moment events are often best. what a fabulous walk, there is nothing quite like a good hike to put the spring back in our steps, no matter what the weather, it's always good to get outside. Sometimes it takes a lot of effort, when it's cold and damp, but once out there, I never want to come back inside! Beautiful vistas! Great to be restored! Glad you took time. I need to take some time myself. Thank you for sharing this beautiful post today. Beauty in your words and photos, Lorrie. I truly understand about your soul being refreshed when you spend time in nature. Your images are truly spectacular. Have a wonderful day! Beautiful images. Glad you felt refreshed and restored. Hope you have a good week. Enjoyed the hike with you, and would enjoy that wonderful snack too! Wonderful post. I enjoyed the hike with you. What a marvelous place. I giggled that you weren't invited to the gull party ... they are like that, aren't they?!!! Sausage, cheese, apple ... yum! Happy Monday! What a lovely, peaceful post. Thank you for taking us along, we felt restored now too. Lovely to see your images here - I enjoyed my walk with you. Beautiful! Love the sound of your lunch and hike! Thank you taking us along on your hike, Lorrie! I loved that you brought hot tea and chocolate with you! I have been on that very trail years ago. You have some beautiful shots! What a great place to take an impromptu hike. We sometimes do a trail in Algonquin in reverse because the best views are at the end of the trail ;) To be honest, I prefer to walk the entire trail and have the views as a special treat ... much more rewarding. Enjoy your week! What a beautiful hike! There's nothing like spending a few hours in the great outdoors to rejuvenate us and soothe our souls. Thanks for these lovely images. Why is it that I feel so revitalized after YOUR invigorating hike?! It is probably due to your engaging description and magnificent photos of your three hour trek in this beautiful landscape. I can hear the gulls, taste the salty air, blink twice at the snowy blanket on the lichen, and touch the sky! I applaud you for your energy! I don't think I'm in the shape to do a three hour hike! Good for you. The skies indeed looked ominous. Did you get a downpour? Gorgeous picture all around! Thank you for sharing your hike with us. You had a wonderful time. The water, the birds and the boat are beautiful. Sausage, cheese, apple and chocolate with your walk must be special. Delicious! I might need more energy to hike! Have a good new week! Thank you for sharing your wonderful hike, it certainly was a beautiful one. I had to look twice at the lichen at first I thought it was snow. Take care. I so enjoyed this walk with you two - love how you do spur of the moment hikes and such - and aren't they usually the best when not planned! The scenery was so beautiful - thanks for sharing everything Lorrie. Lovely images of your hike, Lorrie. The picnic sounds lovely. Getting out and walking in a natural environment, especially one as beautiful as this, is good for the soul....and you both have lots of energy too! A glorious walk - such beauty all around. Wonderful views indeed. How lovely to get out in your part of the world. Your photos are magnificent, and your prose quite entertaining. I enjoyed every moment of the walk with you, and wish dearly I could taste the salt water and hear the cry of the sea gulls, and see the lonely vessel skulking through the hued toned sea. Unplanned excursions are always best, and a cup of tea simply perfect for such a cool day. Enjoyed this post so much, blessings and hugs to you! Thank you Lorrie! Beauty and nature do indeed soothe. It works for me. And it's wonderful to have a quiet beach nearby. Thank you for sharing it! Your observation about familiar trails looking different when following the path in reverse is one I need to remember. Your comment about a fresh perspective reminded me of something a dear friend used to tell his photography students. He said after they took the photo they wanted, they should turn around to see what what was in view behind them. Catching up but really enjoying the "cloudy" photos... I have sort of forgotten what that's like. Still no rain here. You certainly do have beautiful landscapes to walk through.